Everyone on your booking dines for FREE during their entire stay when you book a Disney Moderate, Deluxe or Deluxe Villa Resort Hotel and Ticket package for a minimum of 5 nights in 2020. You can also enjoy FREE Breakfast if you stay in one of our great Disney Value Resort Hotels! Free Dine Offer is available to book 25 April 2019 – 05 November 2019 for selected arrivals and participating resorts 01 January 2020 – 29 March, 2020 and 19 April 2020 – 03 October 2020. Stays are subject to room availability. 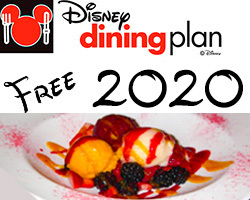 Eligibility for the Disney Free Dine offer requires a minimum length of stay of 5 consecutive nights, and a maximum of 21 consecutive nights at the same participating Disney Resort Hotel. Free Breakfast Offer is available to book 25 April 2019 – 5 November 2019 for selected arrivals 1 January 2020 – 29 March 2020 and 19 April 2020 – 3 October 2020. Bookings must include 5 nights’ minimum stay at a participating Disney Value Resort Hotel plus purchase of Disney Tickets for the whole party travelling to receive a free breakfast (Quick Service Meal Voucher) per person per night of stay. Quick Service Meal Vouchers are not valid for children under 3 years. 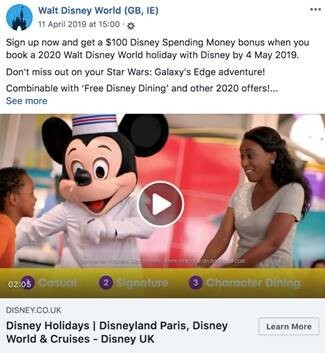 US$200 Disney Spending Money offer: Available to book 25 April 2019 – 02 July 2019 for selected arrivals 01 January 2020 – 29 March 2020 and 19 April 2020 – 03 October 2020. Booking must include 5 nights’ minimum stay at a participating Disney Moderate Resort Hotel, Disney Deluxe Resort Hotel or Disney Deluxe Villa Resort. Disney Spending Money will be provided via a Disney Gift Card loaded with 200 Disney Dollars to be spent at Walt Disney World Resort and select US Disney Stores only. 14-day ticket for the price of 7: For Disney Resort Hotel bookings over five nights or more, made by 31 December 2020 for arrivals until 31 December, the 14-day ticket (Disney’s 14-Day Ultimate Ticket) is available for the price of a 7-day ticket (Disney’s 7-Day Ultimate Ticket). Disney’s 14-Day Ultimate Tickets expire 14 days from the first day of use. Disney Resort Hotel and Tickets must be purchased at the same time. For child tickets, children must be aged 3–9 years at the time of use. Participating Disney Value Resorts (Free Breakfast Offer only): Disney’s All-Star Resorts, Disney’s Pop Century (excluding pool view rooms), Disney’s Art of Animation (excluding Little Mermaid standard rooms). Participating Disney Moderate Resorts (Quick Service DDP): Disney's Caribbean Beach Resort, Disney's Coronado Springs Resort (excluding water view rooms), Disney's Fort Wilderness Resort & Campground, Disney’s Port Orleans Resort - Riverside (excluding standard view and standard view 5th sleeper rooms) and Disney's Port Orleans Resort – French Quarter. Participating Disney Deluxe Villa Resorts (Table Service DDP): Disney's Animal Kingdom Villas – Kidani Village, Disney's Beach Club Villas, Disney's Boardwalk Villas, The Villas at Disney’s Grand Floridian Resort & Spa, Disney's Old Key West Resort, Disney’s Riviera Resort, Disney's Saratoga Springs Resort & Spa and Boulder Ridge Villas at Disney's Wilderness Lodge. Please note, Disney Deluxe Villa Resorts cannot be booked more than 330 days in advance of check-out date. Planning on travelling between 4th October 2020 – 23rd December 2020? Unfortunately, you’ll miss out on the Free Disney Dining offer, but you can still enjoy a 10% discount on your Hotel and Ticket package. Plus, when you stay at a Disney Moderate, Deluxe or Deluxe Villa Resort you will also receive $200 Disney Spending Money! The 10% Disney Resort Hotel discount offer is available to book 25 April 2019 – 05 November 2019 for selected arrivals and participating resorts 04 October 2020 – 23 December 2020. Stays are subject to room availability. Eligibility for the 10% discount offer requires a minimum length of stay of 5 consecutive nights, and a maximum of 21 nights at the same participating Disney Resort Hotel. Offer is only available if a package including accommodation at a participating Disney Resort Hotel and Disney Tickets for the whole party are booked together. The number and type of rooms allocated to this offer are limited and subject to availability. This offer will also be available on the .ie website. So free dine is on until 5th Nov but the gift card only until the 3rd October ? Edited And the block dates sat to the 3rd oct but the 5th Nov in the title ? ...take me back to the magic! Thankyou ! Only skim read it first thing this morning and couldn't remember what I had read ! Nice to see something for after 03/10. A bit of a blow and nowhere near as good a deal but something. Nope it’s only on till the 3rd Oct but you can book your holiday with free DDP up till the 5th. 3 weeks AKL?! Yes please! Isn't it book until 5th Nov 2019 for bookings upto 3rd Oct 2020 for DDP and book by July 2019 for $200 stay by 3 Oct 2020? I said it last night & I’ll say it again I find it very interesting the limits they’ve put on the dates & hotels themselves this year. I wouldn’t be surprised if this is the start of them phasing it out & that next year it might only be available for the summer months or only available if you stay at a deluxe.